The Environment Agency is issuing farmers and landowners with guidance to help them manage slurry storage and consider the impact of spreading manures and dirty water on land during the winter and wet weather. The guidance will be issued through farming unions and the farming press and offers advice on both best practice and legal requirements to help farmers deal with the problems caused by full slurry stores and waterlogged land. 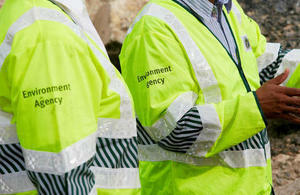 It will provide advice on spreading slurry while minimising the pollution risk. The Environment Agency investigated a suspected slurry pollution in Woolsery, Devon, this weekend that polluted a watercourse and caused a substantial fish kill. Most farmers have a manure management plan and this will help to identify when it is safe to spread livestock manures and dirty water in order to avoid causing water pollution. The soil is waterlogged The soil is frozen hard The field in snow covered The soil is cracked down to field drains or backfill The field has been pipe or mole drained or sub-soiled over drains in the last 12 months Heavy rain is forecast in the next 48hours. Good farming practices have contributed to environmental improvements in water quality and biodiversity in the South West. If you use contractors, ensure they are aware of pollution risks on your farm and that they use safe application rates and check that all equipment is in good working order and calibrated to give a known application rate and uniform spread pattern. Also, check field drain outfalls and surface waters frequently during and after spreading slurry, solid manure, and dirty water to make sure there is no pollution. This guidance will provide farmers with advice on spreading slurry while minimising the pollution risk, damage to the environment but also meeting legal guidelines. on any areas where you are not allowed to because of specific management agreements. Livestock manures are valuable sources of nutrients and organic matter. Correct application of manures will reduce your fertiliser costs, improve soil structure, and reduce the risk of causing pollution.